A stageplay, two books, portions of another, and a chapter from one mashed up with a magazine article are the source materials for these great screenplays. Adaptations can lead to rich story lines, as the two intersecting stories that make up a normal formula movie can be unexpectedly contrasted. Given the typical source material’s richness and different format, however, sometimes resulting movies lead to lines such as “I liked the book/play/musical better” by the disappointed fans of said source material. Yet these selected screenplays do stand on their own and have their nominations well deserved. They are: Argo, Beasts of the Southern Wild, Life of Pi, Lincoln, and Silver Linings Playbook. As with the Original Screenplays, these scripts are analyzed from a structural point of view, using the Blake Snyder Beat Sheet as reference. NOTE: Studios, producers and writers will often post screenplays for public viewing for a limited time. If the links on this page to the screenplay you are interested in is not functional you may contact A Film Look to request a copy of the screenplay, free of charge and only for legitimate educational purposes. All copyrights are of their respective owners. Additional screenplays upon request. written by Chris Terrio. Based on the May 2007 “Wired” magazine article entitled “The Great Escape” by Joshuah Bearman; and chapter nine of the book entitled “The Master of Disguise” by Antonio Mendez. A riveting screenplay with strong dramatic tension played against the comic relief of the improbable plan of using a fake movie (Argo – A Cosmic Conflagration) to “exfiltrate” six Americans from Iran during the hostage crisis of 1979. As outlandish as that may seem, the story is based on true events sourced from CIA declassified information. Argo’s screenplay logs in at 121 pages, its movie time 120 minutes; the closest of all nominated scripts to follow the adage, “a page a minute” (though this shooting script probably has a higher page count, with all its omits and stage directions). Formulaic structure beats put the catalyst around page 13, decision at page 27, b-story page 33, and midpoint at page 61. Catalyst: Sixty nine days after the American Embassy has been taken by Iranian students, Tony Mendez, an exfiltration specialist for the CIA, gets the call. He is informed about six Americans that escaped the takeover and are hiding in the Canadian Ambassador’s residence (p.13-14). Decision/B-Story: The decision is not stated in so many words but comes directly from a scene on page 28 in which Mendez, estranged from his wife, is on the phone with his young son as they watch a movie on TV together. That movie is Battle for the Planet of the Apes (1973) and on the TV is a shot of a desolate, arid landscape. The next scene takes us to a movie set in Hollywood, setting up the second (b) story, explicitly launched eight pages later when Mendez directly asks John Chambers, Oscar winning makeup guy, to help him make a fake movie (p. 35). Midpoint: Mendez arrives to Istanbul, makes final preparations to go into Iran. Stories merge: the fake movie goes to meet the real world it’s been created for. Drinks are collected in the airplane as the captain announces they’ve entered Iranian airspace (pp. 60-64). The constant use of the line “Argo F*** yourself” in the screenplay makes it seem trite, but in the film itself the actors’ delivery make it live well and highlight the contrast between the drama and the comic relief that makes this a great movie and story. Kudos to them. Argo has also been nominated for Best Adapted Screenplay by the Writers Guild of America. A story about a girl named Hushpuppy that seems defenseless and abandoned in a world of her own. We discover through the script, however, the complex relationships of a social nucleus, which could be described as an independent tribe, detached from mainstream society. Within its own rules, its own relationships, Hushpuppy is in fact an active member of this “village”, not abandoned at all. As her and the tribe’s world crumbles and mainstream tries to absorb them, Hushpuppy leads her fellow villagers in the challenge against forced change — and into an unknown future, all fearlessly independent but united at the same time. A short script by regular standards (76 pages), it is rich in description and characterization, not filled with expository or otherwise long dialogue. Catalyst should be around page 8, decision at page 17 and midpoint at 38. Catalyst: Daddy Wink is gone (p. 10). Hushpuppy feels abandoned and tries to make sense of her world. Decision: Hushpuppy burns her house down, forces daddy Wink to let her stay in the Shacko in the Backo (p.15). B-Story is about Wink’s terminal illness and Hushpuppy’s care and concern for him (p. 15-17). Line: “This is most important thing I can ever teach y’all. You got to take care of people that’s smaller and sweeter than you are.” – Miss Bathsheba. The script relies extensively on description and action lines to transmit the intention of the story, not too much in character interaction through dialogue. That is why, to pull off the movie, Quvenzhané Wallis’ portrayal of Hushpuppy’s emotions and transformation is critical — and gave her the nomination. Beasts of the Southern Wild SCREENPLAY is no longer available for download. Life of Pi is about faith and the inner strength that comes from faith driven will. A short screenplay, at 73 pages, given the nature of the story (half of it occurs on a lifeboat at sea with a boy and a tiger). Yet the movie lasts 127 minutes, mostly screen time after the script’s midpoint. By the formula, page count puts catalyst at page 8, decision and b-story on pages 16 and 20, and midpoint at 37. And they are. Catalyst: Adult Pi is visited by a writer who asks Pi to tell him a story he’s been told will make him believe in God. Pi answers: “…As for God, I can only tell you my story; you will decide for yourself what you believe” (p. 9). Thus a double story line is set, one in the present one in the past, which should have its own catalyst a few pages later. This new catalyst is the introduction to Young Pi by his secular mother of the story of toddler Krishna, the Hindu god, and the universe in the god’s mouth (p. 12). This is where Pi’s wonderment for the divine begins. Decision: The major decision affecting Pi’s life is his acceptance, in spite of his family, of god as a universal divine — to the extent he is comfortable practicing three religions at once (pp. 17-18), including all their rituals: prayer mats, baptism, etc. For the interest of brevity and to move the action (and to the tiger), editing of the religious debate in the book is made, yet the adaptation remains true to the story (read an extensive commentary about Books to Screen here ). B Story: This is the story of the relationship between Richard Parker, the misnamed Bengal tiger, and Young Pi. A classic emotional story, except that one of the parts would be (perhaps) quite content to devour the other. It starts exactly where it should (p. 20: “An adolescent Bengal tiger appears…), and the danger in this relationship is quickly established. Midpoint: The ship has sunk, Pi is now on a lifeboat. His only companion, an injured zebra. A hyena comes out from hiding, an orangutan comes by, floating on top of a pile of bananas. “Welcome to Pi’s ark” Young Pi tells the orang as he helps her climb aboard the life boat. Richard Parker is nowhere to be seen (p.37-38). Thank you. And so it goes with God. The screenplay synthesizes the book well and its action lines and sequences after the midpoint are the most difficult; but the vision of the director, the palette of the cinematographer, and the empathy of the writer have combined and brought to life a remarkable rendition of the better story. Life of Pi SCREENPLAY is no longer available for download. Life of Pi has also been nominated for Best Adapted Screenplay by the Writers Guild of America. written by Tony Kushner. Based in part on Team of Rivals: The Political Genius of Abraham Lincoln by Doris Kearns Goodwin. The screenplay has a 125 page count and the movie clocks in at 150 minutes. Following the Blake Snyder beat sheet structure framework, the catalyst should be defined around page 13, the decision, b/emotional story beats at pages 28 and 34, and the midpoint at page 62. Catalyst: The elections of November 1864. In order to pass the Amendment at least twenty more votes are needed than republicans have in the House of Representatives. While seemingly backstory, the action derives from this incident, as Secretary of State Seward is told by Lincoln sixty four democrats lost their seats in that election and will be looking for work, come inauguration (pp.12-14). Their votes could be up for grabs. Decision / B-story: Lincoln informs the cabinet his decision to take the 13th amendment to a house vote by January 31st and sign it February 1st, fully knowing that the votes to pass the amendment are still not locked in (pp. 26-28). The emotional story is harder to identify where it really starts, but is obviously the relationship of Lincoln as father and husband to his family in struggle with Lincoln the president affecting his own family’s life. Represented at first by Tad, his youngest (first seen at p. 10), it is highlighted primarily by the conflicts, internal and overt, with his son Robert (first seen in p. 37) and carried through the voice of his wife, Mary Todd Lincoln (whose emotions start to play out on p. 39). Midpoint: Lincoln commands a war action from the Telegraph Office at the War Department (p.62). Hundreds of dead on both sides as the rebels defend Fort Fisher, in Wilmington, from a barrage of artillery as reported on the wire. The defeat of the secessionists makes imminent an end of the hostilities, which in turn would make moot, in the minds of some, the need for the 13th amendment. “It’s not illegal to bribe Congressmen. They starve otherwise.” – Robert Latham – An Albany political operative. “This isn’t usual, Mr. Pendleton, this is history.” – Schuyler Colfax, Speaker of the House. Two strong themes that, however, do create a weak spot in the screenplay: to play them out a great amount of exposition is required—people in rooms, talking to each other. Yet the other elements of the script, its structure, dialogues, themes, etc., make it a very strong contender in the category. Lincoln SCREENPLAY (May not be available after Feb. 24th). 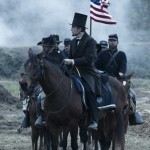 Lincoln has also been nominated for Best Adapted Screenplay by the Writers Guild of America. This story is about a man coping with the fact that he is mentally ill, struggling to be functional in a dysfunctional world. Because of his mental condition, Pat’s world has turned into a dark storm cloud — he lost his wife (Nikki), he lost his job, he lost his house — and he is desperately, maniacally, looking for a silver lining in it all. The page count for the script is 151 pages, the movie lasts 122 minutes. The sharp discrepancy in page count over movie time comes from the screenplay being dialogue heavy, as opposed to action / description laden. Following formulaic dictates, the catalyst should be at page 16, the decision and b-story leading into the second act on pages 34 and 41, and the script’s midpoint on page 76. While clearly backstory, this incident is presented as flashback at the (almost) appropriate catalyst pages 20-22, set up by events on page 16: he hears his wedding song in the therapist’s office muzak and goes berserk. But the true catalyst for the movie story is when Pat gets invited to dinner at Ronnie and Veronica’s, on page 30, almost too late in formula terms. Decision / B-Story: On page 35 Pat tells his therapist he wants to work hard to get a shot at the silver lining, pull his life together and get his wife back. He is told he needs a personal strategy to do so. Shortly after that, at the end of page 40, Tiffany walks into Pat’s life. Midpoint – At midpoint, Pat’s mental state is shown at its worst: he just screwed up his own glimpse at a strategy for getting back to Nikki, he is taunted by kids in costume, a police officer threatens to send him back to the mental institution, and he is hallucinating the wedding song. At the depth of this despair, Tiffany reaches out and calms him down (p. 76). A new, personal, relationship with Tiffany starts from here. This screenplay is all about the dialogue: a complex story brought out by the spoken interaction between the characters. No big action scenes, no overwhelming nature scenes. The embedded emotion and subtext in almost every line makes this an outstanding script. This allows the actors to bring forth the best in themselves and expose depth of character. Not since Reds (1981) had a movie’s actors been nominated in all four acting categories, the fourteenth film in 85 times to have this distinction. The performances in SLP rise to the level of Network (1976), which won three of its five nominations for acting (double nomination for best actor in a leading role). Silver Linings Playbook SCREENPLAY is no longer available for download. Silver Linings Playbook has also been nominated for Best Adapted Screenplay by the Writers Guild of America. The other nominee from the WGA is The Perks of Being a Wallflower, screenplay by Stephen Chbosky; based on his book.